For the life of me I cannot think of anything to write tonight. I think my brain is telling me it has done enough work today and it is now time for bed. So I thought I would share some Tasmania shots with you all. 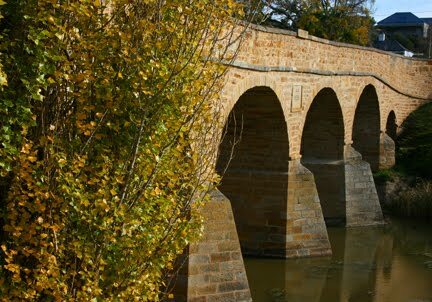 The foundation stone for the Richmond Bridge was laid on 11 December 1823 and construction continued using convict labour until completion in 1825. The bridge was originally named Bigge's Bridge after Royal Commissioner, John Thomas Bigge, who recognised the need for the bridge in 1820. 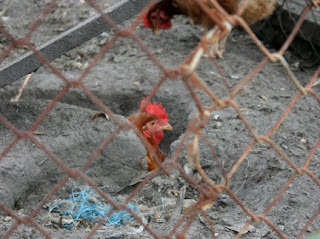 No theres no story to this one, it's just a plain old chicken digging a plain old hole. I know how you feel. Sometimes the juices just don't flow. I do love the chicken in the hole. I make breakfast sandwiches called egg in a hole. You rip some bread out of the center of a slice, crack an egg and put in the hole and then fry in a pan. Could you put a chicken in the hole? Hmmmmmm. Just reading about the bridge today in the RACV mag. We missed it when toured Tassie. A good reason to go back.